An historic day for the Nepean Football Association (NFA) who will welcome their first synthetic fields thanks to the NSW State Government and the first round of the Greater Sydney Sports Facility Fund. Jamison Park Fields 6 & 7 will be converted into two state of the art synthetic fields, with the project totalling $3.7 million. Minister for Sport and Member for Penrith, the Hon. Stuart Ayres announced the funding at Jamieson Park on Monday 21 January. The Minister confirmed the successful grant of $2,500,000 with Penrith City Council contributing $1,100,000 and NFA adding $75,000. Over 12,000 registered players will benefit from the installation of the synthetic fields at Jamison Park which gets used by football all year round. Football is no longer a winter sport with participation during the summer skyrocketing to over 40,000 in the 2018/19 season. The summer football competition, Walking Football program and the Football4All program at Jamison Park will thrive with the inclusion of two synthetic fields. 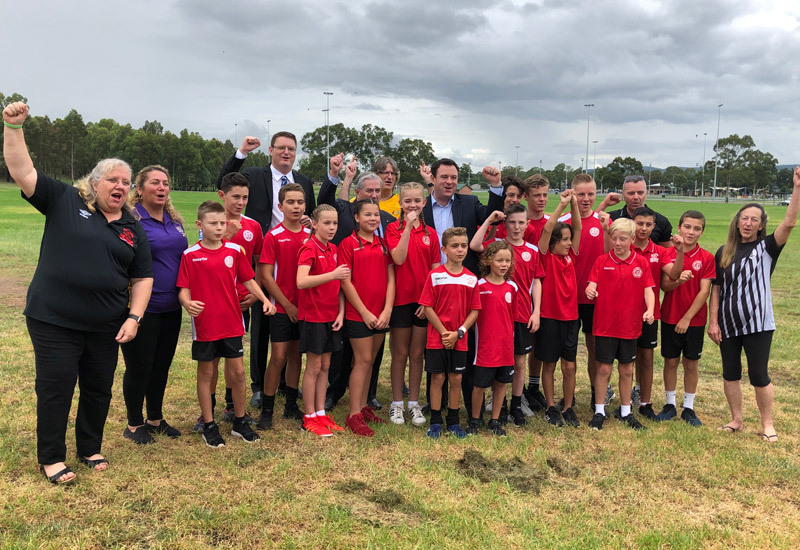 Football NSW CEO Stuart Hodge commented, “We welcome the two synthetic fields at Jamison Park and thank the State Government for their contribution”. “Synthetic fields allow significantly higher use compared to natural grass fields, synthetic fields allow over 60 hours of usage, double the amount of any natural grass field. The synthetic fields will allow competitions and training to continue uninterrupted while providing a consistent and safe surface all year round”. Nepan FA CEO Linda Cerone highlighted the significance of the new synthetic fields. “This is landmark day for the Nepean Football Association, football continues to grow in the Nepean region and with the inclusion of 2 new synthetic fields this will ensure football continues to be the largest sport in the Nepean region”. Jamison Park joins the ever-growing list of synthetic footballs fields in Sydney which is now creeping towards 50. With NSW population expected to grow rapidly over the next 20 years synthetic fields are one of the main solutions to ensure participation growth in the future. The two synthetic fields are expected to be built and completed in 2020.